August 19, 2015 August 19, 2015 by Beau H.
There’s really no underestimating the power of a great basic in a guy’s wardrobe, whether it’s a pair of dark denim or a crisp Oxford cloth buttondown or a sturdy pair of boots. The khaki chino occupies that same space – it’s the ideal balance between dressy and casual, especially in the manner that current brands have been making them. That typically means a slimmer fit and the lack of pleats that characterized a lot of khakis in days past. And if you’ve paid any attention to the rise in American-made goods these past few years in the #menswear world, you might’ve heard the name Taylor Stitch. The brand takes a two-pronged approach to distributing its clothing, using a mixture of customer-funded campaigns (similar to Gustin’s approach) and stocking year-round essentials one can pick up at any time. Its Standard Issue Slim Chino (newly restocked in sizes 28 to 36!) is one of those essentials, and for great reason. 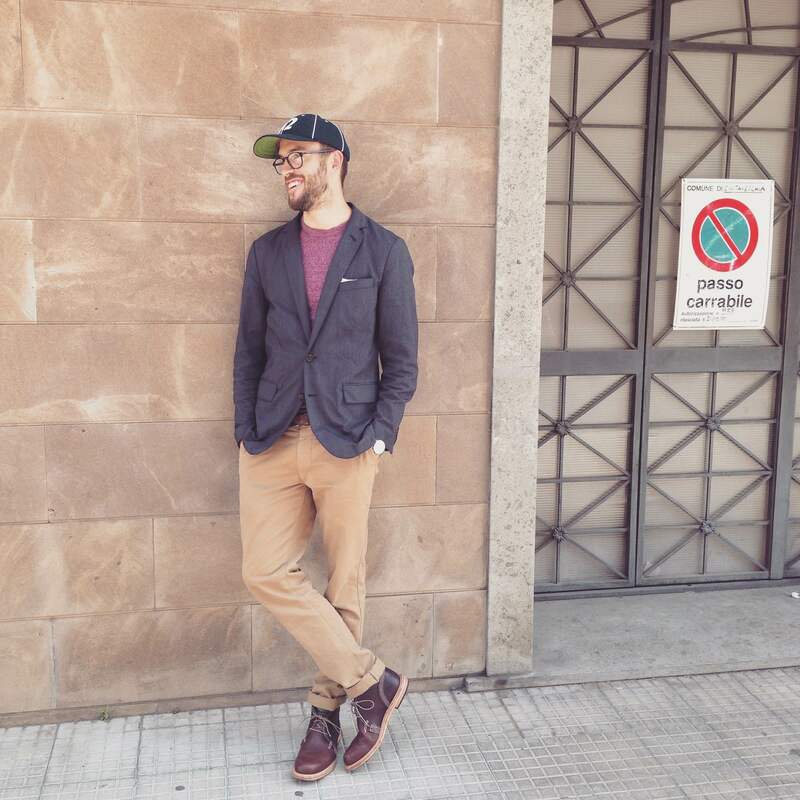 Another way to style these chinos, also from my travels to Italy and Greece. 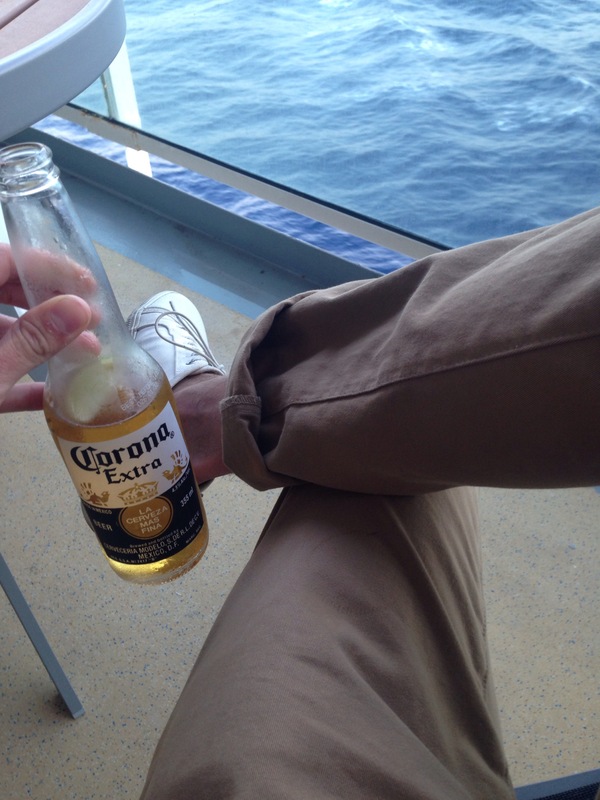 Corona not included. White sneakers by GREATS Brand. Although the pant comes in Olive and Navy as well, the Khaki Slim Chino is as close to a perfect pair of pants as you can get. For those times when dark denim might not work, this pair acts as an ideal dressier stand-in – especially with a classic, unconstructed navy blazer as seen here. The great folks at the brand worked with me on a review of the chinos for GearHungry earlier this spring, and I’ve had the chance to test them out all through the summer – including on a lengthy trip to Greece. While one could argue that a khaki chino is only part of a rotation of pants – and thus you could afford to skimp a little – this pair from Taylor Stitch makes the exact opposite case. That is, it’s so versatile and you should (presumably) get so much wear out of it that it absolutely pays to divvy up a little cash up front. Namely, the fabric on these chinos is something else. It’s a soft, custom cotton blend chino that’s brushed for softness – something you can tell right out of the box. There’s no absurd stiffness to these, making them easy to wear right away. While some definitely prefer a heavier chino fabric (and some brands, like Gustin, make a living doing that), having a pair that feels broken-in is a big benefit. But, that broken-in feel doesn’t mean you’re getting a pair of sunfaded chinos that have also proven popular across the past few seasons. In fact, the color on these is even throughout – and has remained that way despite washing throughout the summer. And if anything, the fabric has gotten softer over time – making them even easier to wear. Note that the fabric certainly isn’t your average, flimsy-feeling pair from a cheaper retailer –- but it’s also not a true lightweight chino a la Bonobos. Regardless, the versatility and durability is a huge selling point and makes it easier to wear them more frequently. Thankfully, these don’t need to be treated like raw denim, unwashed for months at a time. 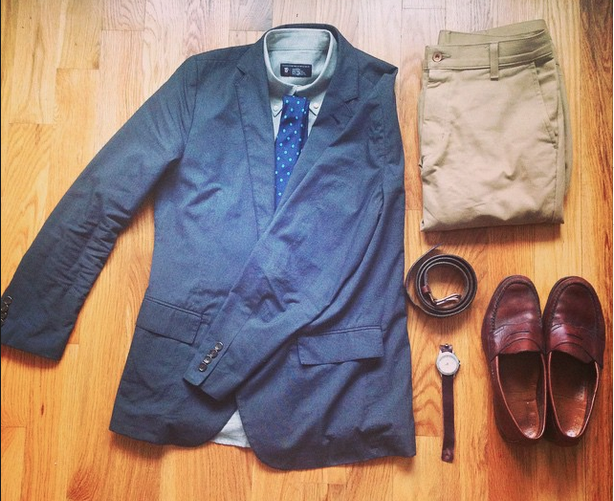 Yet another situation in which these chinos do well — business casual. Blazer by J. Crew. Heather Herringbone Shirt by Combat Gent. Pindot tie by Express. Loafers by G.H. Bass Horween leather watch strap by Form-Function-Form and Ameritus Sport watch by Timex. Belt by Target Merona. And that’s lent itself to some nice outfit combinations across the summer. I’ve paired them with everything from a heathered burgundy pocket tee and navy sneakers (a favorite combo) to a blazer and chukka boots. Throwing them together with a slim chambray shirt and brown leather loafers has also worked well for dressier situations. The fit on these is also to be commended. If you’re unsure of trying out the brand, it’s worth nothing that these fit remarkably similar to any other mainstream (and arguably lower-quality) pair from one of an industry big shot. (looking at you J. Crew). So the fit is trim to be sure, but offers more give through the thigh than one might expect. It’s perhaps closest to a Levi’s 513, but the brand also offers a Democratic fit that’s slightly looser but still tailored. Crucially, the waist band fits comfortably on a size 34×32 – it doesn’t bunch when worn with a belt, something that can occasionally be a problem. Watch out if you happen to be more vertically challenged though – the chinos arrive out of the box with a 36-inch inseam, meaning that I’ve chosen to cuff and roll them (as you can see in these photos). You could also take them to a tailor to have them hemmed if you know a particularly good one. A closer look at the vintage map detailing and sturdy hardware that help set these chinos apart. As to be expected with a pair of American-made chinos, the detailing is superb. Sturdy bar tack stitches hold the pockets in place on the interior of the chinos, while the front copper button is reinforced, too. Those who appreciate good design should also enjoy the vintage San Francisco maps printed on the interior of the pockets, and the tag noting it’s American-made is always nice to see. With a pair of pants like these, it’s not a stretch to say you could put together five different outfits, each with a completely different vibe (that might sound familiar to those of you who read my Effortless Gent series!). From rugged long-sleeve henleys and cardigans in the winter to white sneakers and a simple T-shirt in the summer, this really is a four-season pair of pants (the fabric certainly lends itself to that). So the next time you look to buy a pair of chinos, look West – and get out that credit card. 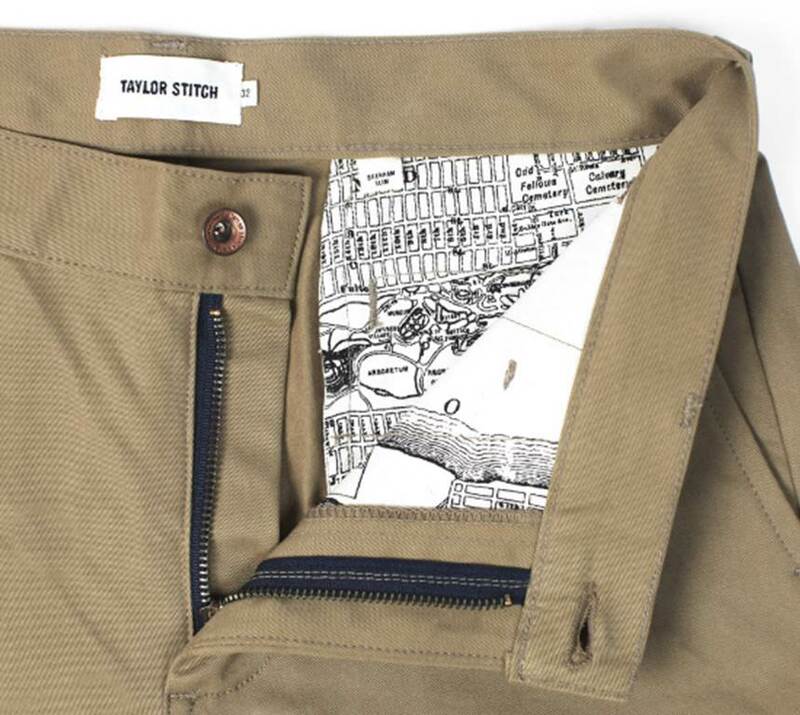 Do you own a pair of Taylor Stitch chinos? Or will you soon? How would you style these?